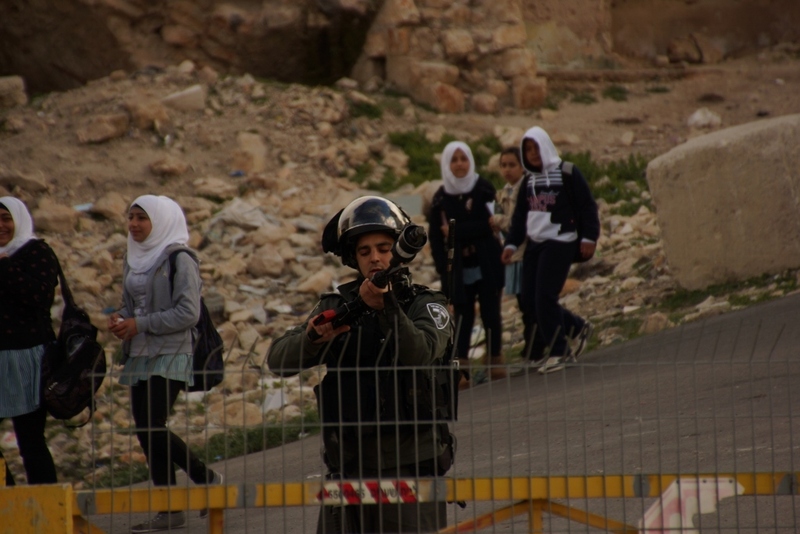 Children who cross checkpoints 29 and 209 on their way to school in the morning were exposed to teargas and sound grenades used by Israeli soldiers on seven of the last 8 school days. 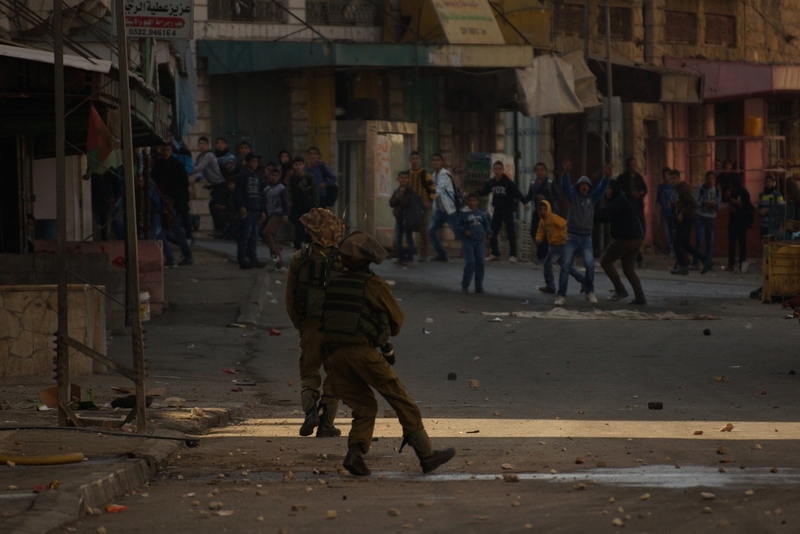 International observers and human rights workers in Hebron have witnessed Israeli soldiers repeatedly firing tear gas grenades and sound bombs into the streets near these checkpoints while children are walking to school. The children attend several schools located both in the Old City and in the area of Hebron designated as H2, on the other side of the checkpoints, and include preschool students as young as 4 years old. Depending on where they live and which school they are enrolled in children have to cross these checkpoints in both directions to reach schools both inside the old city and in H2. Because of the checkpoints and the closing of the Old City, children have very little choice in how to get to school and are forced to use the routes that take them through these dangerous areas. Because the buses which transport younger children to preschool and kindergarten classes in H2 are not allowed to cross the checkpoints, very young children living in the Old City must walk through these checkpoint areas to reach their school buses. At times the use of teargas by soldiers has been in response to one or two children throwing stones, but internationals have also witnessed soldiers firing tear gas canisters without provocation. In either event, because so many children pass through the same area to reach school at the same time, hundreds of children, many of them in primary grades, are impacted by the gas on almost a daily basis. Teachers, including women, must also travel the same difficult routes to school. 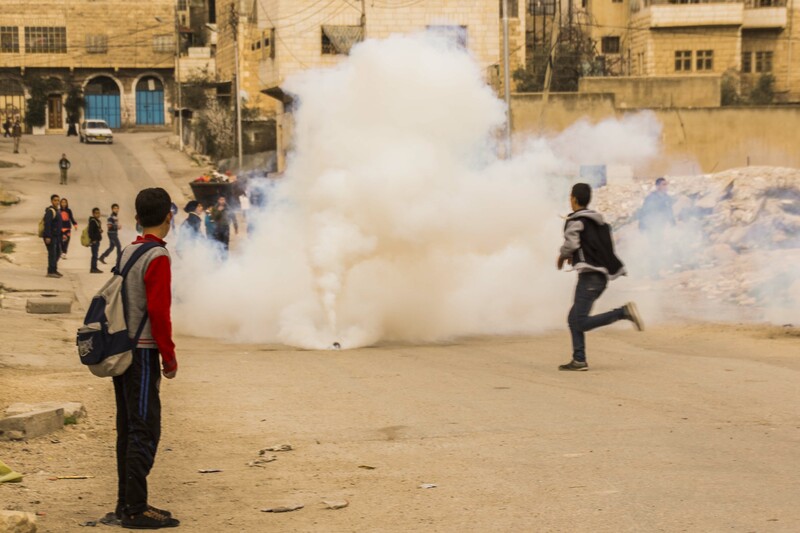 And because the chemicals used in teargas are solids, they remain in the streets and shops, and in the clothing of children who are exposed, resulting in repeated exposure. Although the Chemical Weapons Convention (CWC) prohibits the use of tear gas and pepper spray in warfare, however domestic police and state forces are allowed to use these weapons on people as “riot control” agents. Soldier just after firing teargas into a group of children near Taareq Bin Zyad school before school. Tear gas is a non-lethal chemical weapon that stimulates the corneal nerves in the eyes to cause tears, pain which can be extreme, immediate and severe nausea, and even blindness. Longer term effects include persistent coughing, shortness of breath, and other lung-related problems (heighted in people who already have lung problems), heart and liver damage, delayed menstruation, and an increase in miscarriages and stillbirths in women exposed to the gas. The NGO Physicians for Human Rights believes that “ ‘tear gas’ is a misnomer for a group of poisonous gases which, far from being innocuous, have serious acute and longer-term adverse effects on the health of significant numbers of those exposed.” In addition to the effects of the gas, the teargas cartridges fired by soldiers can cause serious injury and even death if they strike people, especially if soldiers fire the cartridges straight into crowds rather than into the air. 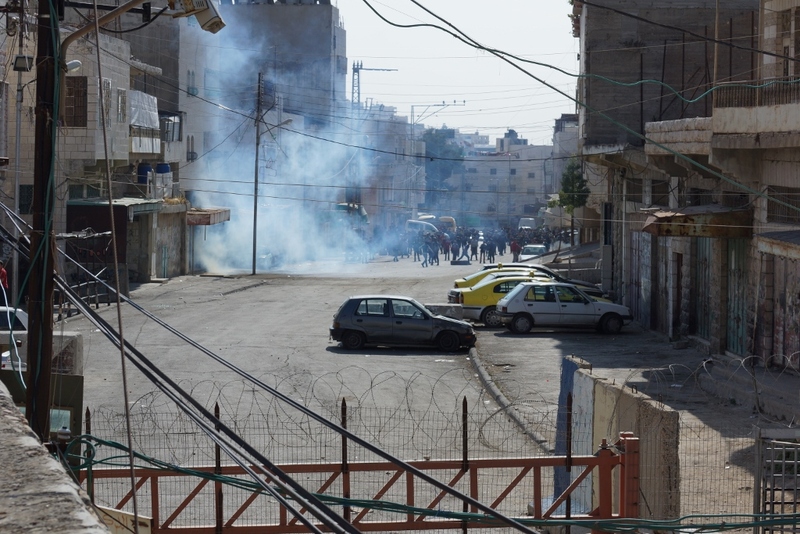 Internationals and Palestinians report having seen soldiers fire teargas straight into the roads near these checkpoints. 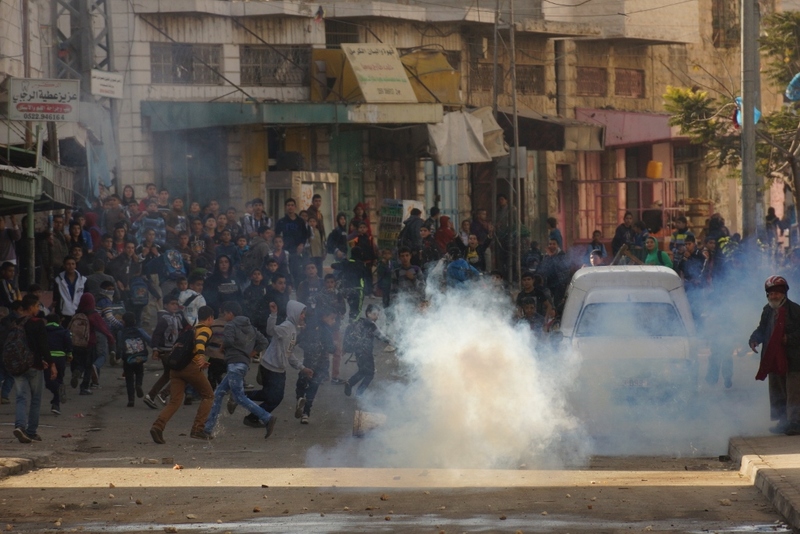 The teargas used on school children in Hebron comes primarily from the United States. and is manufactured primarily by Combined Systems Inc. of Jamestown, Pennsylvania and Defense Technology of Casper, Wyoming. Combined Systems Inc. (CSI)—often manufacturing under the brand name Combined Tactical Systems (CTS) are owned by Point Lookout Capital and the Carlyle Group. 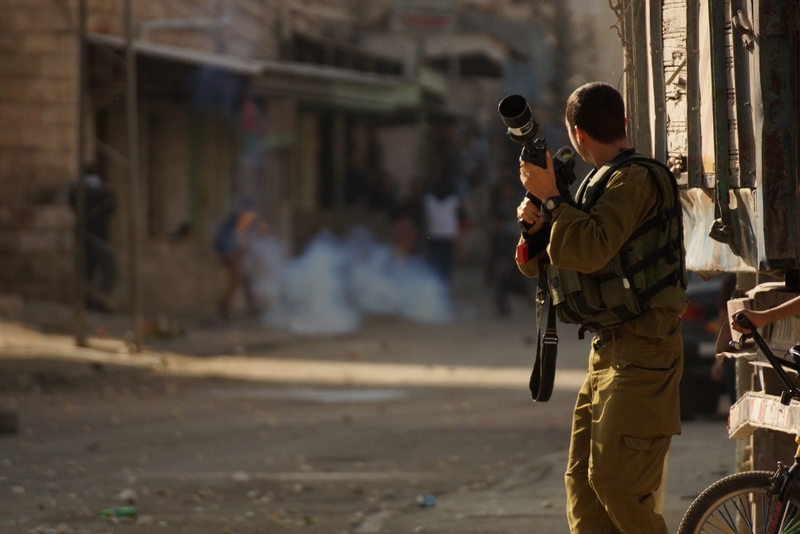 CSI is the primary supplier of tear gas to the Israeli military as well as a provider to Israel’s police (and border police) for use in occupied Palestine. Defense Technology is headquartered in Casper, Wyoming. Along with U.S. company Federal Laboratories, with which it shares a product line, it is linked to the U.K. arms giant BAE Systems through BAE’s ownership of U.S. arms company Armor Holdings.